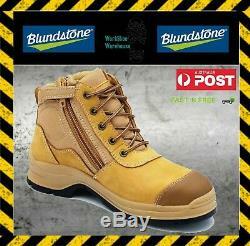 BLUNDSTONE'318' ZIP SIDE WORK/SAFETY BOOTS WHEAT NUBUCK LEATHER STEEL TOE CAP. This lightweight lace-up style provides excellent ankle support while the heavy duty zip provides for easy on easy off. It's also packed with safety features like a steel cap for maximum impact protection and electrical hazard resistance. Tough toe guard extends the life of your boots. XRD® in the heel strike zone for supreme shock absorption. Thermo urethane outsole highly resistant to hydrolysis and microbial attack. Oil, acid and organic fat resistant. Outsole heat resistant to 140°C. Removable PU footbed is anti bacterial, breathable and washable. Certified to: Standard AS/NZS 2210.3.2009 - Classification 1-ID 2815 Certified to: Standard ASTM F 2413-11 including electrical shock resistance. However please be aware that we cannot accept footwear back which has been worn and/or shows signs of wear. You are welcome to try your new footwear on but please do so on a carpeted area and do not wear them outside until you have decided to keep them. But what we can do is offer you our great Australia post rates! In both cases, return of the shoe back to us must also be forfeited by you. Changed your mind and no longer require the boots? We are happy to take them back. The item "BLUNDSTONE'318' ZIP SIDE WORK/SAFETY BOOTS WHEAT NUBUCK LEATHER STEEL TOE CAP" is in sale since Sunday, April 22, 2018.